As Julian Edelman put in a MVP performance at Super Bowl LIII, the calls for Canton came strong. (From the likes of ESPN’s Adam Schefter, even.) There’s no doubt that Edelman is one of the most reliable and clutch receivers in Patriots’, and arguably NFL, history. Just like Wes Welker before him, Edelman always seems to show up to make the third down conversion and he did that Sunday. But is that enough to make Edelman a Hall of Famer? There are a few things going for Edelman=. One is that Edelman is now a three-time Super Bowl champion, and in all three games, he has made a noticeable impact. Despite only scoring a touchdown in Super Bowl XLIX against Seattle, Edelman has registered 24 catches and 337 yards in the three games he has played. In addition, Edelman didn’t have the chance to do much in the Patriots’ two Super Bowl losses, which came in Super Bowl XLVI and LII. While he’d played receiver and defensive back throughout the 2011-12 season, including in the AFC championship game, Edelman was pretty much left to kick returning against the Giants in that Super Bowl in 2012. And he tore his ACL in 2017, missing the entire 2017-18 season and the Super Bowl where the Patriots lost to the Eagles. So you could argue Edelman is even more valuable to the Patriots than people think. Another argument for Edelman is to look at another receiver who largely performed at the Super Bowl for a team in the middle of a dynasty and made the Pro Football Hall of Fame. Lynn Swann’s NFL career was defined by Super Bowl X. He only made four catches that game but they were four of the most crucial catches for the Steelers in their 21-10 win over the Cowboys. In the Steelers’ four Super Bowl wins in the 70s, Swann tallied 364 receiving yards and three touchdowns, including his 164 yard performance in Super Bowl X. In this pre-Jerry Rice era for receivers, Swann entered the Pro Football Hall of Fame in 2001 despite only having a regular season high of 880 receiving yards. It’s those regular season stats that are ultimately Edelman’s downfall at the moment, and they don’t favor him against Swann. Right now, both receivers have played nine seasons (not counting Edelman’s 2017 due to injury). In the regular season, while Edelman has two 1,000 yard plus seasons and Swann has none, Swann slightly outranks Edelman in receiving yards (5,462 to 5,390) and easily outranks Edelman in touchdowns (51 to 30). Edelman has more catches (499 to 336) but when comparing stats from someone now to someone from an era (and a team) that relied less on passing, you have to have better stats than this to get into Canton. Swann had the luxury of playing in the right era and having a legendary Super Bowl moment, and it still took him nearly 20 years after retirement to get enshrined. So by that standard, Edelman has no chance right now in this era. And I haven’t needed to mention his four-game suspension from last season due to performance enhancing drugs; that may hurt his chances with some voters. Having said that, hope is not all lost for Edelman. At 32, and with Tom Brady showing no signs of retiring anytime soon, Edelman could still have a few good years ahead. He’s definitely not going to get in with his regular season stats so far, but while he can boost them a bit, even better chances could come from further top performances in the playoffs and the Super Bowl. Another Super Bowl MVP and a couple more titles may overcome the lack of stats. 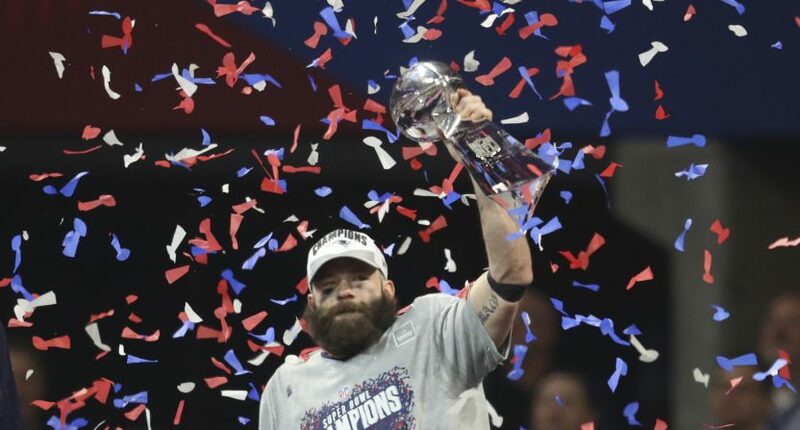 But for now, while Edelman will certainly be someone we’ll remember in NFL history, don’t expect to see his bust in Canton yet.